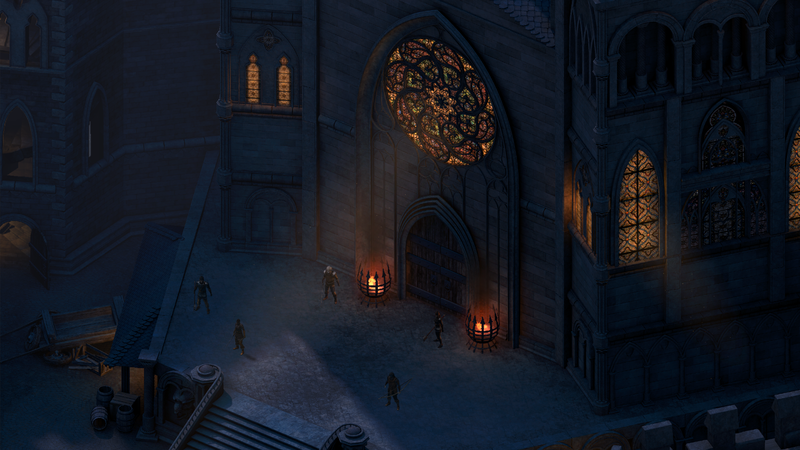 Pillars of Eternity is about a month away from release, so with the game mostly finished I got the chance to sit down for one last, lengthy chat with Obsidian's Josh Sawyer to talk expansion plans, sequel rumors, why PCs are amazing, fast/slow mode, Big Head Mode, Gothic castles, and why Might affects the damage inflicted by a pistol. All that and more, below. Side note: While Sawyer talked, Obsidian's Nick Carver was playing through some optional sections of the game for us, so if you see any references to "that hero" or the like, just assume it's Sawyer referencing whatever was on the screen at the time. Also, I have no idea what the official spelling is for some of these areas and characters. I guessed. Sue me. 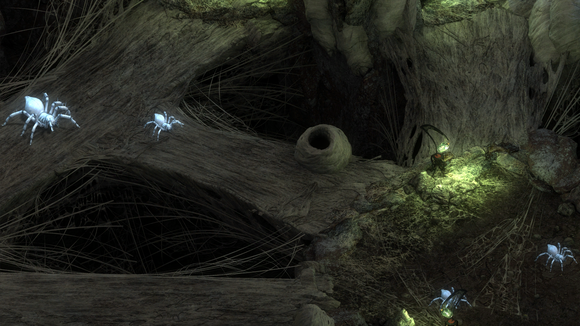 Josh Sawyer, Obsidian (JS): One of the areas we're showing right now is Radric's Hold. 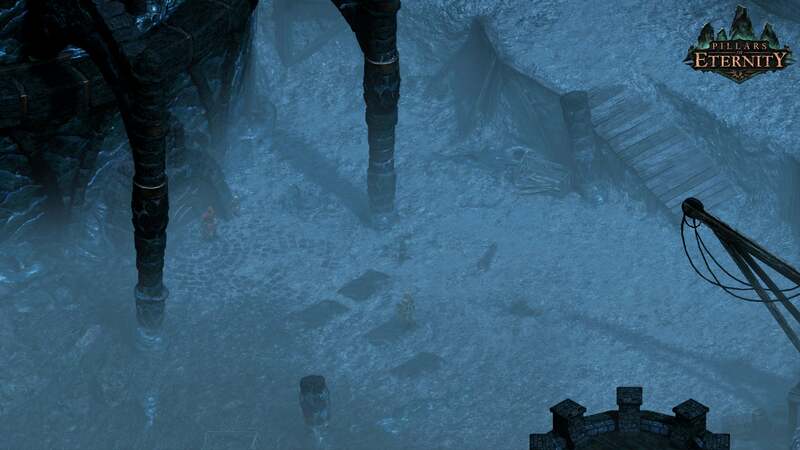 Radric's Hold is encountered within the first couple of hours of the game. You can tackle it immediately. You can wait and come back. There's no level-scaling or anything so you can do it in whatever order you want. It was important for us to have these grand-scope, very cool 2D environments. This is a Gothic Castle. One of our designers was like "Can we please just have one Gothic Castle?" so we decided to make Radric's Hold. It is actually a dungeon. You can use some diplomacy as you go through it. You can use stealth. You can use your skills in different ways. First, though, we're going to try and just barge our way in, which is one way you can do it. It is a real-time with pause combat system, so at any time you can pause the game. You also have a lot of auto-pause options. A lot of players prefer to have things set up ahead of time so if a character goes down, something happens, it'll pause right away so they can give new orders. JS: In a big battle like this where there are a ton of combatants you can also go into a "Slow Mode." Slow Mode doesn't run at half speed, it runs at 2/3 speed. It's just enough to bring the speed down so things become a little bit easier to follow, a bit easier to manage. You don't have to quite micro and pause so much. Not only do you have a slow mode for combat, but you have a fast mode that's good for exploring quickly—usually re-traversal. 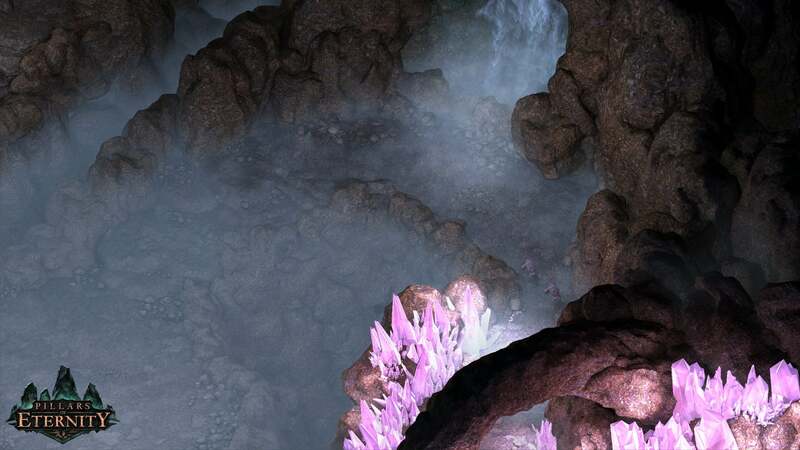 Exploration is a big part of the game but re-traversal is also a big part of the game that's not necessarily super-enjoyable. Fast mode helps you book it through there. JS: There are 11 different classes. This is all part of the Kickstarter campaign. They all play very differently. We did design the game so you don't have to have a nuclear party. You don't need to have a fighter, a rogue, a wizard and a priest if you don't want to. You can make gimmick parties, you can make a party that's all paladins or all rogues and wizards. Whatever you want. 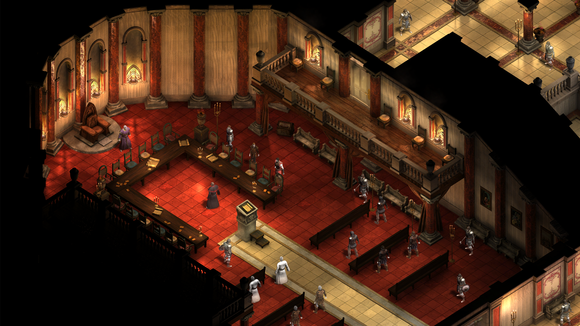 It is designed so the game will be viable and completable no matter how you built your party. This party that we have right here—all of these characters are companions except this one, which is the main. She's a rogue. There's a fighter. That's Khana, a chanter or bard. That's Durance, the guy who looks like an insane Rasputin. He's a priest. That's Aloth, who is a wizard. And the last one is the Grieving Mother, who is a Cipher. In this case we do have a nuclear party. The way we set up our companions is to cover a wide set of classes. If you just sort of go with inertia you will end up with a nuclear party. But even so, we didn't want to design the game in a way where you required that. If you don't like these guys, you don't have to take them. In fact, you can even make your own additional characters that are just Adventurers and add them to your party. You can also play solo if you want, although that's incredibly hard. You'll notice every character [Nick] is playing has some active-use abilities. We did try to make sure that if you wanted to make a character that's very active, even one that's traditionally fairly passive like a fighter, you did have lots of active-use abilities. However it can be a lot to manage six characters like that, so you can also build characters that are almost fully passive. You don't really have to manage them a whole lot. You can plant them in a location, say "defend that" and they work pretty much fine like that. FIghters are probably the most passive in terms of how you can build them. You can build up their defensive abilities so they lock people down when they come near, you get a lot of defensive bonuses, they regenerate damage over time, and they have a consistent progression of damage. So if you want them to stand in a location, not die, and do consistent damage? They're great. You can also build them to be very active though where they're doing crowd control, they're knocking guys away, things like that. There's nothing I would say "Don't play this if you're a beginner" because when you start out you're only managing your own, single character. I think we progress in a way where it's pretty easy to manage. But I will say that rogues and monks tend to be, of the melee classes, much more active. And especially rogues are much more fragile, and can get screwed up very fast. JS: We really put a lot of effort into our stat spread. We've tweaked and tweaked and retweaked this over time. For instance, the Might score increases damage and healing for everything. You might say, "Dude, why should Might affect the damage of my pistol?" and I say, "Shut the $#&^#& up." The point is that it's good for any class that wants to focus on that. Intellect increases the area of effect and duration of any ability you use. You don't need to be a wizard or anything like that. It's not a perfect 1-to-1 where you can build whatever you want and there's no trade-off, but if you want to build an idiot muscle-wizard, which is very important to me, you can. If you want to build a brilliant fighter, that's also a very viable character. If you have an idea for a cool character we don't want to say "No, that's unrealistic." We want to say "What's a way we can support that and make it fun?" We only have five non-combat skills in the game. We did that because we wanted to make sure each skill got a lot of use, regardless of who had the skill. Aloth is very focused in Lore. Lore is great in conversations for your main character but it's also what's used for reading scrolls. Yes, you can make a fighter that just reads scrolls all day long. It's not a restricted skill. Nothing is a restricted skill. You do not need to have a rogue if you want to disarm traps or be stealthy. They're better at it! But it's not a requirement. Let's say you wind up with six characters that have the Mechanics skill jacked up. Because you're &%^#%ing crazy. You jack them all up. Every character can plant one trap at a time, and the Mechanics skill will increase the accuracy and the power of that trap. So if you want to make the trap-laying party? You can jack everyone's Mechanics and go out and place all that. If you jack everyone's Lore skill, they can all use scrolls. If you jack everyone's Survival skills, all potions will last longer and all food items will last longer. We tried to make sure every skill has some usefulness if you have some overlap or redundancy. It's frustrating to build a character and then someone joins the party that has the same skillset and you're like "Well, thanks dude. That's useless." JS: (To Carver) Show one of Aloth's AOEs. You can see there are two radii for that. The inner circle is completely friend-or-foe. Everyone will be hit [by the spell]. That border area? That's a bonus from his intellect, and that area is foe-only. So you can throw a fireball and if something falls in that outer ring, if it's an ally they won't be hurt. That's a way we allow those spells to scale without, "This gets bigger but my party gets hurt more easily." JS: Guards will call for help. They won't run away but they will call for help. And you do have to be careful about where you choose to engage them. You can actually take on individual guards by themselves, but there are patrollers so you might have adds, and when you have those adds they might shout and pull guys from behind them. You kind of have to watch. 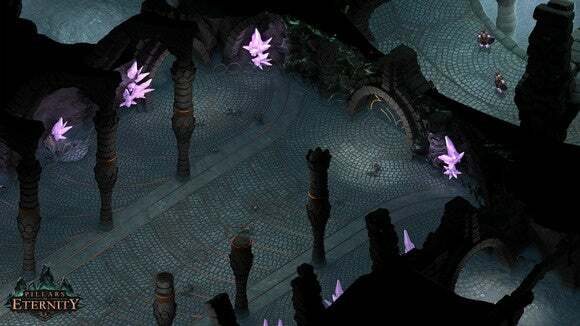 We tried to make sure every map did have some patrollers on it because even a few of them can really change the dynamics of how fights play out. 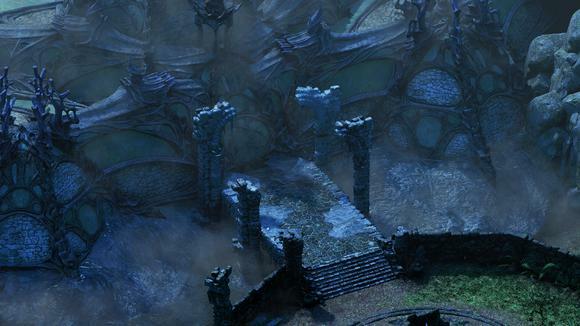 Read on to page two for more information on expansions, tabletop Pillars of Eternity, Big Head Mode, and more.